There’s nothing quite like walking into a small urban diner, with flashy chrome to greet you; a long, well-worn formica counter in front of you; and swivel stools to sip your coffee from classic white porcelain mugs, elbow to elbow with your neighbors. Even if we haven’t experienced this ourselves, we’ve seen it in movies like Men in Black and Goodfellas. But it’s a tradition that’s fast disappearing in the Manhattan borough of New York City. Marc Gordon, partner at Spacesmith, an architecture, interior design, and consulting firm, has been documenting the mid-20th-century prefab diners in the metropolis and watching with chagrin how many have been demolished in favor of high-rises that give a better return on investment. We talked with Gordon about this unique building type and the challenges facing them today. 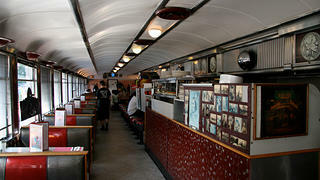 The interior of the Empire Diner maintains its classic look. 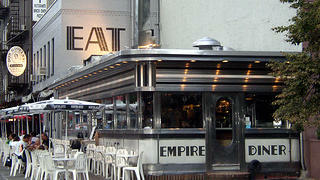 The Empire Diner was featured in the classic "Men in Black." The Cheyenne closed in 2008 and was moved to Birmingham, Alabama. The interior of the Cheyenne before it was moved to Alabama. What exactly are prefab diners? Prefab diners were manufactured in a factory and trucked to the site where they were assembled. They were made to travel over bridges and through tunnels. They started out as lunch carts in the Northeast. A lot of veterans from World War I got into the business. At the time, there were a lot of old train and trolley cars that were being decommissioned, so they were used as lunch carts and diners that were marketed toward the working class who were looking for inexpensive meals during the work day. These were made for where you couldn’t fit another building—odd corners, empty lots, things like that in urban areas where they were set down. They were turnkey businesses. Eventually, as the roads expanded, there was a need for people to eat on the road, and that’s when you start to get roadside diners. What are some of your favorites in Manhattan? 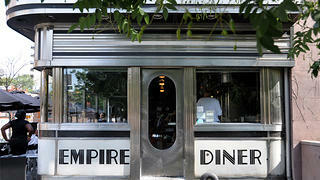 The Empire Diner stands out. It was featured in Men in Black. The Square Diner in Tribeca is another one. It’s been completely renovated. They’re disappearing because of gentrification and increasing real estate values. The land is too valuable [in Manhattan]. You walk down one street and six months later it’s completely different. There are more in the outer boroughs, but I can count what’s left in Manhattan on one hand. Another thing that happens is that many have been completely renovated. All of the original details have been stripped to match with a more modern aesthetic. In the 1950s, it was all about modern material—glass block, stainless steel, porcelain enamel. In the '60s, the aesthetic became sort of Space Age-y, and in the '70s they went Colonial and were bricked over. The eating habits of Americans have changed, too. The advent of fast food restaurants [affected it]. Diners provided cheap meals to the working class, but a lot of those neighborhoods in Manhattan have been gentrified, and the populace doesn’t support the diner business model. There are about four prefab diners left in the city. 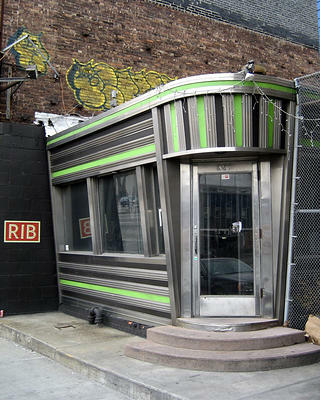 This prefab diner, set in an awkwardly-sized lot, closed in 2006 and was demolished for a residential building. What is your hope for the future of prefab diners? There’s still a lot of buzz about prefab buildings. Homes are being modularized where they build sections on site. Prefab diners are a truly American cultural phenomenon, and it’s sad that they’re disappearing. I think they’re being recognized, but they’re not being recognized as much. Because they are transportable, they can be moved. The Moondance diner was moved to Wyoming, for instance. 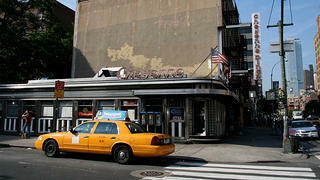 One diner in Manhattan, the Munson Diner, was placed on the National Register. It was moved upstate. 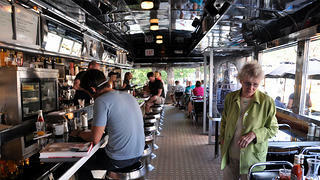 I wonder if the prefab diner building type will be reinvented, or if it’s part of nostalgia. I [once] went into a diner that had a baby grand piano and was serving high end food. There could be ways to repurpose these places.